It has been a while since our previous Street Talk episode, but I was facing some technical difficulties. My Sony ActionCam got into a jam and I had to send it off to Sony for repair. Now it is back and I can start recording the Street Talk episodes again. In Street Talk Episode #07 I talk about “How to choose a camera for street photography”. The day of the recording I grabbed my gear, hit the streets and found a lovely peaceful location where I relaxed and started recording. The place is called Fortezza and it is an old Venetian fortress in Rethymno where I live. I enjoyed sitting there amongst these old walls and buildings where so much history has been written. I could feel the vibe of the place and it inspired me. So, in this video I mention what I take into consideration each time I decide to shop for a street photography camera and I share with you my opinions on each parameter that I think is important. 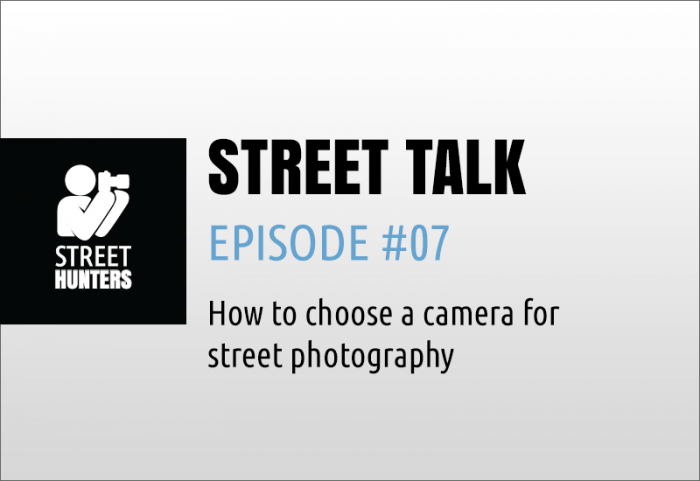 Once you have seen the video you will understand that choosing a camera for street photography is a personal process that should follow logical steps. However, when all is said and done, you need to take a leap of faith and just go with your gut feeling. Of course after you have taken into account all the parameters I mention, your gut will easily know which camera is right for you, so it is a combination of logic and emotion, just like jumping into a new and exciting relationship. I totally agree with size and weight, as I carry mine wherever I go (including work, shopping, having a meal, parties). I have some other (probably strange) criteria, like focal length 24 mm, ISO 80, and image format 4:3. Glad you enjoyed the video Never Edit! I am looking forward to seeing what gear you will be packing during the Athens Flash Street Photography Workshop! A really good After many years of using Canon film cameras and a decade with the Contax G2, I made the plunge to digital. My first digital camera was a Sony DSC R1 only because it had a Carl Zeiss lens and I had used 5 beautiful CZ lenses with the Contax. From there I moved to full frame Canon and had both the 5D and the 5D MKII. It started getting crazy with each purchase of an L series lens – the cost and the weight. I sold the lot and purchased a Fuji X100 limited edition in beautiful black. I ran with that, evening gaining second place in the Isle of Wight Photographer of the Year competition. It was and still is a fantastic camera. I now shoot with an X Pro 1 and just two lenses: 35mm f/1.4 and 23 mm f/2. A perfect kit for street photography and travel. My settings are almost fixed at f/5.6 through to f/1.4 – f/2 with 95% of my stuff street and 5% travel. If I had the spare readies I would probably upgrade to the X Pro 2 but it would be an indulgence to be honest.